That’s really a magical drawing, Michael. The details and the colours are amazing, but “Hector” steals the show. 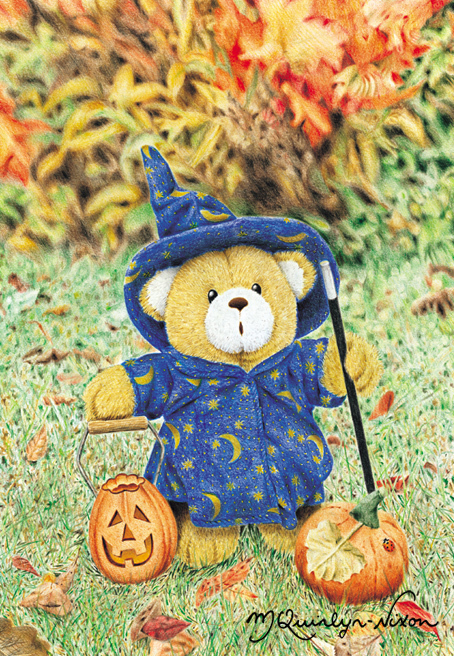 Have a great Halloween weekend! Thanks for the message and the compliments on my work, Peter. I really did enjoy drawing this bear – his expression was priceless. I have just returned home from seeing some of my family in Whitby, North Yorkshire, where there were a large number of people (all ages) dressed in beautiful gothic costumes – obviously for Hallowe’en. Some outfits were pure Victoriana and others modern dress, quite a sight to see! I didn’t see any wizard-like characters, so maybe I should have invited Hector to come with me. Hope you and ‘the hug’ are all doing well. Enjoy your weekend too. 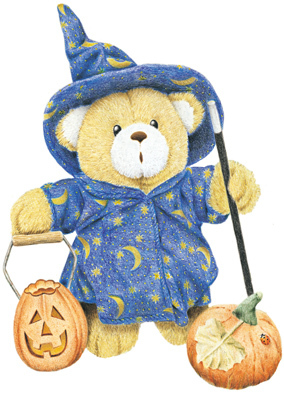 Hi Michael, love to see your Bear pictures, and as you know I appreciate how much work goes into them. My Mum sent me a ‘Help the Heroes’ Bear recently who was dressed in a khaki jump suit, it was ‘orrible so I took it off poor little Joe (new name) straight away. It took me a few weeks of searching to find him some civi’s, and in the end it has turned out to be a Christmas jumper designed as a wine bottle dressing! It fits him beautifully. So there you go, I’m as mad as you! Roz.